The Baffin Chloe snow boot for women is one of those unique boots that is at home in many places. Unlike many other snow boots, the Chloe is one of those rare winter boots that won’t cause strange looks from co-workers at the office or weird stares from people during a night out at an in-town restaurant. The Chloe combines an attractive design with the rugged durability and warmth found in other Baffin winter boots. And this combination allows the Chloe to be at home on the farm, on a city bus, in the office, or out in the woods. The Baffin Chloe Boot. More info & prices at Amazon. Like other Baffin snow boots, the Chloe has a rubber outsole, making the boot 100% waterproof and making cleanup simple. The boot also provides solid, if unspectacular, arch support. The insulating layer of the boot consists of seven layers of a very soft insulation called Thinsulate, with a Thermaplush liner. Besides being warm and soft, the Thermaplush liner proves helpful in other ways, too. The Thermaplush mimics a sock liner by transferring perspiration (sweat) from the foot to the insulation. The keeps the foot dry, and thus warm. Now, like other rubber bottom winter boots, much of the insulating value of the boot will be lost by wearing cotton socks. For all the details of why this is so, read the Importance of the Winter Sock article. But for a quick summation, in a rubber bottom boot the foot will ineviably sweat. A cotton sock will absorb that sweat and soon become rather wet. The sock then coats the entire foot with a thin layer of water. And a wet foot is a cold foot, no matter how fancy the winter boot might be. And perhaps more importantly for those who use the boot in public places, a wet foot is also a superb recipe for smelly feet. 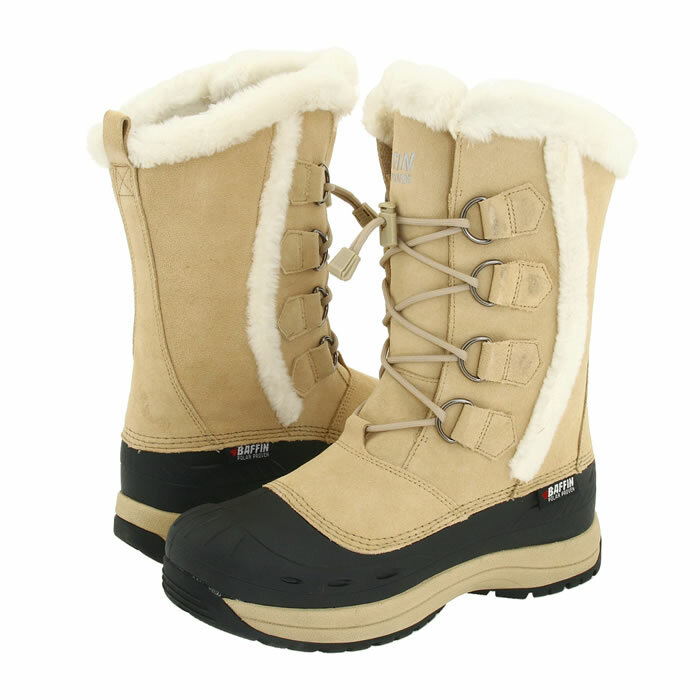 Overall, warm, attractive and lightweight, the Baffin Chloe boot is an excellent snow boot for women. Attractive enough for use as daily wear, the boot also pulls double duty as an effective snow boot for a wide range of conditions encountered in normal in-town life. The boot is equally at home in the city as it is in the backcountry. The Chloe boot is widely available online, as well as offline in stores located in northern climates. The Chloe is generally priced around $150, although Amazon often sells them for less. Other online retailers where the boot is often available include REI, Shoes.Com and Shoebuy. Temperature Rating : -40 degrees. Colors Available : The Chloe comes in various colors which change yearly. Weight : 1 lb 6 oz. Sizes Available : 6 to 11, while sizes. Stylish. The fur trim and attractive stitching makes the boot look great. Warm. Rated to -40 degrees Fahrenheit. Lighweight for such a warm snow boot, topping the scales at just 1 lb 6 oz.